The LED lighting industry is fast-flourishing with a surge in LED usage across the globe owing to the continuous emphasis on sustainability. As various government agencies worldwide keep pushing for eco-friendly alternatives, the paradigm shift to LED is inevitable. Supreme Components International Pte. Ltd. (SCI) has been at the forefront of this disruption by trying to understand the dynamics of this market and helping suppliers and OEMs. The ecosystem of an LED supply chain can be understood in terms of how manufacturers and suppliers interact with their customers. 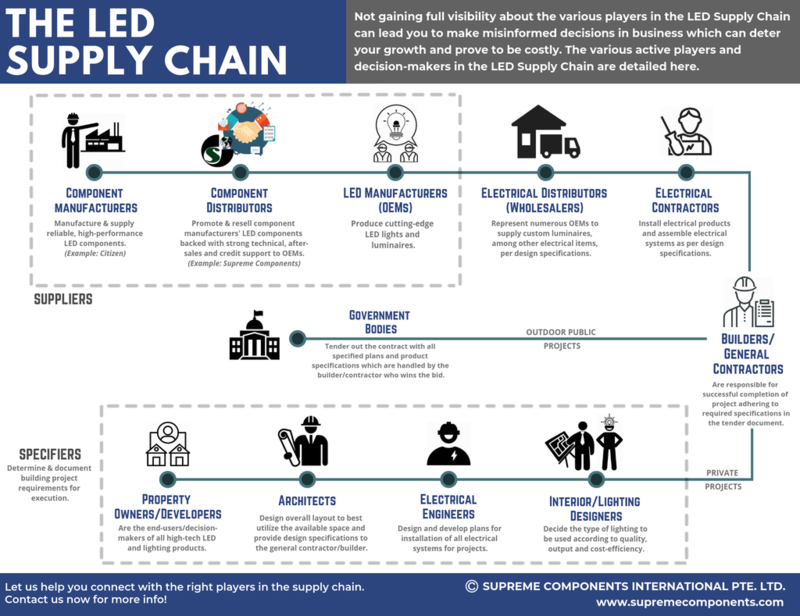 This infographic underscores the various players within the LED supply chain and how each one influences the demand/supply for LEDs. When a property developer or house owner decides to go ahead with designing a real estate/property, the architects along with the lighting and interior designers play a key role in finalizing the type of LED lightings to be used. The specifications for different luminaires are documented and sent to the builder (general contractor) who in turn delegates it to the electrical contractor. The procurement of these lighting supplies is handled by electrical wholesalers. 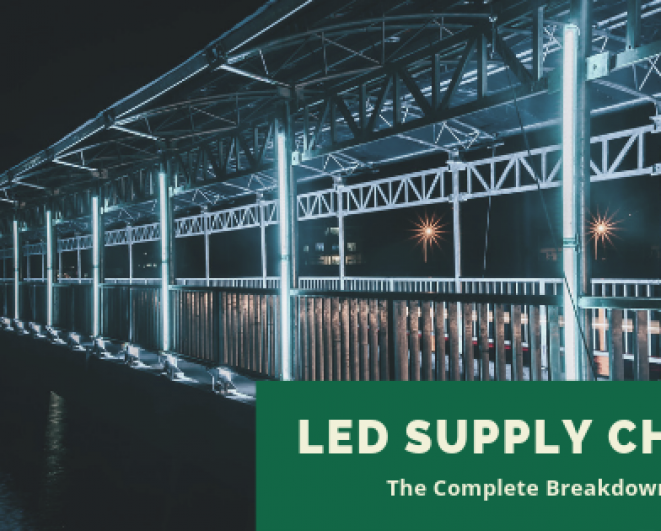 At this point in the supply chain, general contractors can try and convince the builders to use low-cost lighting products substituted in place of the specific high-tech LEDs requested for by the lighting specialists. This can prove detrimental to the progress of many OEMs as lower quality variants may be pushed in by the wholesalers for a cheaper price. LED-based Original Equipment Manufacturers should look to actively tap into the interests and trends observed in the rapidly changing LED market. Close attention should be paid to research & development to identify customer needs and key factors influencing the design of lighting products. As an authorized and reputable distributor, it is important for SCI to position ourselves strongly in order to ensure that the supply needs of OEMs are met with high-tech quality LED components from reliable franchises. We also provide the necessary expertise required to understand the rapidly progressing LED lighting market in a global context. SCI is proud to have launched a set of robust LED driver selection tools for leading global brands. This innovative and mobile-friendly tool-set can help you search for any LED driver series and filter components using different advanced criteria and view results as required. Visit our website now and let us help you crack the code to dominate the LED market-space!